Bengaluru literally means ‘Town of Boiled Beans’. The name was derived from an incident which involved an old woman who served cooked pulses to a lost and hungry Hoysala king. A trip to Bangalore is incomplete without reveling on the glorious buildings of the city. 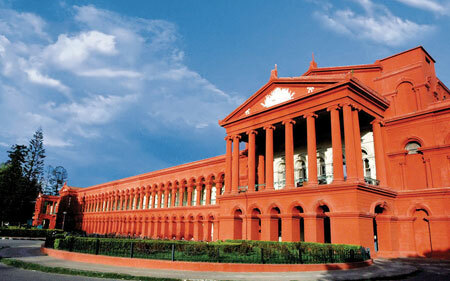 Attara Kacheri is where the Karnataka High Court presides. It is a red brick building built in the year 1884. Attara Kacheri in Hindi means eighteen offices or departments and is a two storey building. The Attara Kacheri was built during the reign of the Emperor Tipu Sultan of Mysore. In his time the offices of eighteen departments extended and they could not be housed in the palace. He constructed a new building to house these departments hence, the Attara Kacheri was born. This place is ideal for a drive through site seeing as visitors are not allowed to enter inside the building. From the road one can see two great buildings face each other, the Vidhana Soudha and the Attara Kacheri. The Attara Kacheri is famed for its architectural style of Gothic construction. The building holds a beautiful golden red look during sunsets and is a site to behold as this building is considered a photographer’s luck. There are other tourist attractions nearby like the Venkatappa Art Gallery, the Public Library, Cubbon Park, the Visveswaraya Industrial and Technology Museum and the Government museum which houses many fascinating collections of sculpture, coins, paintings and inscriptions.